The Egyptian antiquities ministry has rejected a proposal by the finance ministry to rent out the country's major archaeological sites to international tourism companies in an attempt to reduce the government's budget deficit. "How can we rent out our heritage?" 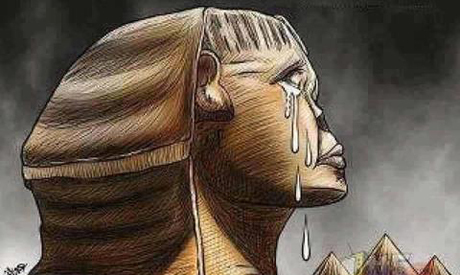 Ahmed Saeed, professor of Egyptology at Cairo University, wrote on his Facebook page, alongside a cartoon of the Sphinx crying. "Cry dear Sphinx, people want to rent you out and maybe later cut you into pieces and sell you! Shame on those who want to rent you. You are the symbol of dignity, power and Egypt’s ancient civilization," he added. Hatem Sewelam, professor of archaeology at Cairo University, said the proposal was a "rumour created by the media." Secretary-General of the Supreme Council of Antiquities Adel Abdel-Sattar told Ahram Online that Abdullah Mohamed Mahfouz of Al-Ketab Al-Mostanir website, had sent a proposal to the finance ministry in early February suggesting the government rent out five well-know historical sites – the Giza Pyramids, the Sphinx, Karnak Temples in Luxor, and the twin Ramses II Temples in Abu Simbel – to international tourism companies for five years at an annual fee of LE200 billion. When the antiquities ministry was consulted it rejected the proposal, stating Egypt’s heritage was public property and could not be leased or sold under the antiquities law, Abdel-Sattar added. Thank goodness. Some things should still be respected for the sake of humanity. Here in the US, nothing is sacred.....nothing. You misunderstood concept. Its not to rent Pyramids but to allow professional company to manage area of Pyramids for benefit of visitors, and financial profit for country. Look at the CHAOS around The Pyramids now... camels walking everywhere leaving tracks of excrement which destroying limestone area its build on. Hundreds of harassing souvenir sellers "invading" every new coming bus with tourists. Lack of proper touristic infrastructure in the area, allowing for CALM & RELAXING visiting this amazing place. If Ministry OF Tourism can improve area into international standards in order to welcome international tourists (sorry, its not only about Egyptians when we talk about World Heritage) - then by all means let Ministry Of Tourism manage it, if not renting to manage is not that bad idea at the end. The current experience around the pyramids is a big hassel of camels, horses, and touts. It was a big head ache to be constantly harrased by these people. It gives a negative image to Egypt as a country. For example, I loved visiting Egypt but I didn't like 90% of the people that I met. Allowing companies to manage these historical sites would be the best thing to ever happen to them. Shame on those who want to rent our Egypt's ancient Civilization. I have a good idea for you, how about you cut your salary in half. I hope that will be achievable. Egypt needs to put right person in right job. We need to have knowledge to deal with Tourism industry. We need to watch and learn From USA. Egypt I am your Son God save Egypt. As the IMF does not accept sand, why not hand over the whole stuff as guarantee for the proposed loan? Egypt has been for sale for too long. It's time to put a stop to this; no longer allow this to continue. We've sold our selves and our dignity to others for too long. The revolution is supposed to restore Egyptian dignity, not create the conditions to sell more of it. Egypt isn't for sale anymore. If the government needs money, they can sell the outdated military equipment that they get from the U.S.